We’re hitting the road to launch ‘Drawn From Deep Water’. There is a run of shows coming up, taking in some of our favourite spots in Scotland. The first gig is part of Edinburgh TradFest in the Scottish Story Telling Centre on Tuesday 30th April. Following that we head to The View in Oban on Wednesday 8th May, then home gigs for Connor and Craig in Comrie and Muckhart respectively. Saturday 11th May takes us a trip out west to the Tayvallich Village Hall before a homecoming in the Blue Arrow in Glasgow with support from Kaitlin Ross (Eabhal) and Catriona Hawksworth (Heisk). 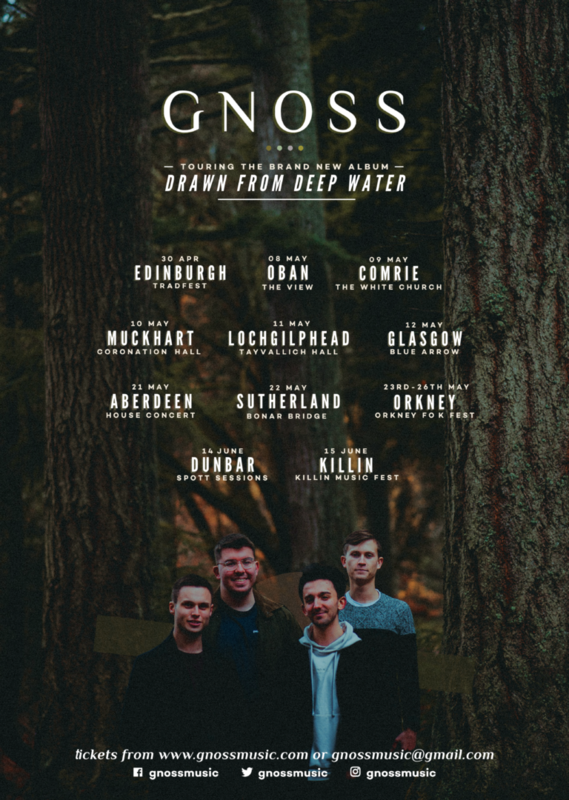 We have a couple of days off before the tour leads us up towards the Sutherland Sessions in the Bonar Bridge Hall followed by the mighty Orkney Folk Festival! June takes us to a couple of new spots – literally – with a show at The Spott Sessions in Dunbar before another festival, this time the Killin Music Festival. Go and grab your tickets from the gigs page. Don’t forget, you can still pre-order the new album before it’s launch on the 27th April. That way you can learn all the words in time for the gigs. Head over to gnossmusic.bandcamp.com for that.